I was going to say it’s not the exercise that’s difficult, it’s the remembering to blog about it everyday. But then I realised that probably means I’m not doing enough exercise! I might have done something everyday, but there are many others on here who have worked a lot harder than me. Well done guys and gals. Looking ahead, I might be in for a clash of dates. If England beat Germany (which I truly believe they will – fool that I am) then their quarter final would be on Saturday 3rd July at 3pm. The 2010 Charmouth Challenge is – yes you guessed it – on Saturday 3rd July at 3pm. Aargh! Even if I run through the finish and straight home I’ll only see the last ten minutes. To be honest I’m more likely to be flat on my back at the finish line for ten minutes! Oh well, let’s see what happens against Germany first. 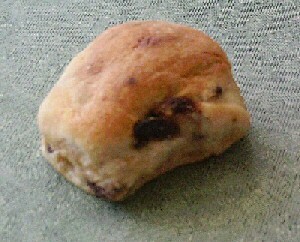 Here’s the Portland Dough Bun that I ate after yesterdays run. Ok, so dough buns aren’t the healthiest thing going. Maybe I should stick to my George Foreman Lean Mean Grilling Machine!